Welcome back! Today, we learn the Simple but Effective table tennis tactics to play against the defenders, the choppers in table tennis. As you know, table tennis tactics are crucial in this sport. So the coach must provide the best tactics to their player to win. You can also read all of my articles related to “Tactics and Strategy” in table tennis here. Xu Xin never lose to the defender! Why? Xu Xin used 3 points-attack tactics to win! Some players use combination bats that help them earn points. They usually force the mistakes of the opponents and then they win the point with the opposite rubber (like long pips, short pips, and anti-spin rubbers). Here are some ways to counter their styles. Here are my quick tips! Short pimples characteristics: Generally short pips used to attack with and they don’t provide much topspin. So you will have to counter-topspin the ball. Please remember to add the lifting force, or the ball can’t go over the net. If the ball is high, just flat hit it with your forehand. The strength of short pimples is the BLOCK. Short pips defenders like to block all of the balls, no matter how the spin on the ball. Bonus: Learn how to block here. They can block the topspin ball, the backspin ball! The best tactic against short pimples is to vary the pace and spin as much as possible. The most difficult shot to control for short pimples is a heavy spinny ball (but slow) and a float ball. So to win short pips, you need to vary the spin of your forehand loop. There are 2 types of long pimples in table tennis: frictionless and friction. Here are the 2 steps tactics to deal with long pips frictionless. The first step, give it no spin. Give the ball no spin and it will come back with float. Chop, push the ball and it comes back with TOPSPIN. Now you can attack the ball to anywhere! You should serve long and flat and then attack anywhere. Don’t be afraid to loop and loop again, just make sure your blade is open and you guide the ball back onto the table after the first topspin. Read all the articles related to table tennis service here. It is very difficult for the defender to control a flat hit with his long pips rubber. So profit it! Serve long, topspin and then flat hit! In general, these types of rubbers are the defensive rubber. However, if your ball has less spin, or high, they can use these rubbers to attack! So be careful! Always keep the ball deep to deal with long pips. They often use the long pimples on their backhand side. By doing this, you can push the defender farther away from the table. You can also vary the spin of your loop. Because with long pips rubber, they are struggling with the no spin, and deep ball! Remember that! And wait for the chance to flat hit, to loop kill to finish the point! Xu Xin eats defender for breakfast. Because of the ability to attack all the ball with his forehand (strength of penholder), and the ability to vary the spin of the loop. One soft, slow topspin, and one fast loop kill. That’s what every defender scares the most! Xu Xin has destroyed many other Japanese defenders! 10-0 in the first set! Read it here. Let’s see how Xu Xin deals with Ma Te. (One of the best defender of China nowadays). 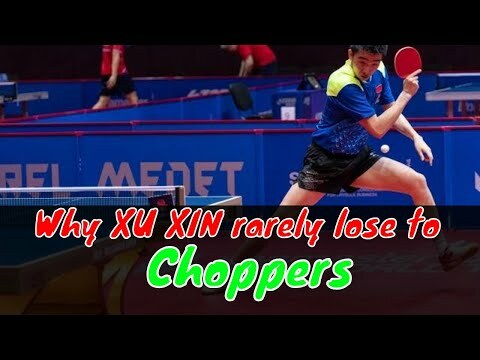 Why Xu Xin rarely lose to defender? Let’s see the Replay of this point, and you will understand the tactics used by Xu Xin! Xu Xin’s first attack is the slow but spinny loop. This kind of loop is a safe option to deal with the first chop and service. You can also see the ability, the footwork of Xu Xin, that he can use his forehand to attack the ball everywhere on the table. The second loop is also a slow and safe attack. But now Xu Xin attack to the wide backhand side of the defender. Why? is weaker, and closer to the net. This is the 3rd loop. When realizing that the chop is weak and close to the net. Xu Xin decided to use the loop kill, to attack strongly the ball (on the bounce) to finish the point. The best strategy to play against good chopper is “force them to give you the weak ball”. What is the weak ball for you? A weak ball is a ball which is returned: too high, close to the net, or with less spin. So that you can finish it with a flat hit, or a loop kill, a smash. (Learn how to smash correctly in table tennis here). Be patient. Don’t attack hard the first ball. You know, that you can’t win the defender with just one attack, right? Use safe, slow topspin to deal with his chop, his serve. Aim to the consistency of your loop. Objective: vary the placement to push the defender far away from the table. Force him to return with a weak ball. And now, use the loop kill, hit the ball hard and fast to finish the point. Understanding these tactics, you won’t lose to the defender unless he is way more consistent and smarter than you. If you are the defender! Or you love playing this style! Because you want to make someone “angry” (just kidding). Here you are! 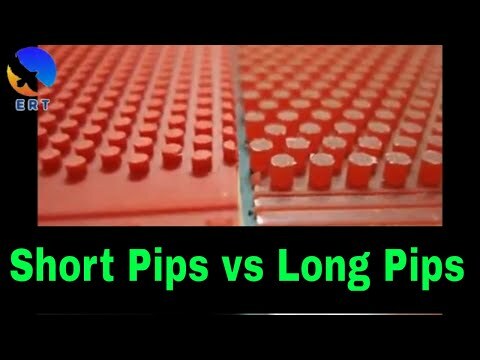 Some famous and well known long pips used by the pro. (Click on the image). Very good one. Should use with no-sponge. The best long pips for chopper! Very consistency for the chop far from the table. Available on Amazon TSP Shop and eBay here. Very popular, with vertical pips. Pro players like using it. Short pips, suitable for both backhand and forehand side. Can be used to attack efficiently. Order this short pips here: Amazon, and on eBay. Why? Because it is the most difficult for the opponents to deal with. Plays similar to Giant Dragon Talon, but a little faster and definitely more tricky. If you like a long pip that is grippy, where you can manipulate the amount and type of spin you are putting on the ball, this is for you. You will get the most pips effect with no sponge. The amount of grip on the pips makes lifting against backspin very effective. Overall, this is a really great rubber! Order on Amazon, or eBay. Very good to flip the short serve. Best pips to block on the bounce. Low throw angle, the counter drive is so easy.